Memories by AmyInKy: Winner, winner chicken dinner!!! OK...so maybe chicken wasn't involved...but we came home with a trophy!!! 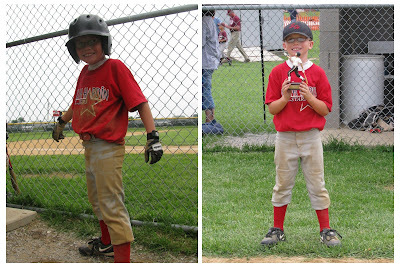 Kevin's all-star team won their tournament on Saturday and a well-deserved trophy! Kevin and I left the house at 8:30 Saturday morning to make the hour drive to the tournament. (Tom took Blake to his tournament in a different direction!) The team lost their first game to the only 7 year old team to beat us this summer - THREE times now - ugh! So, we were sent to the loser's bracket. Thankfully it was double elimination! We game back to meet "the team" in the finals. We beat them, but with one loss each, we had to play another game - our 5th of the day! We won! I should note that we pulled out of the ballfield at 7:15 that night. (And drove an hour to see about 2/3s of Blake's last game in his tournament - a loss to put them out.) It's a good thing I like baseball now! As seen in the photo, Kevin even got to show off his mad sliding skills! This is the second 1st place we've earned this summer, but I think the trophy from this weekend is probably the coolest we've brought into our house. Blake even agreed with me. Kevin was proud to show it off.